My plans for the weekend included a drive to Tobermory, with some kayaking around Fathom Five National Park, and maybe some swimming thrown in for good measure. Mother nature said “Nice try”, and rewarded me with two days of non stop rain and thunderstorms, so I’ve spent the weekend playing ’email catch up’. That’s where I dig through the stratified layers of unanswered mail in my in box, and file and upload all the photos people have sent to me that I’ve buried on the third page of my Gmail account. In the morning, though, I shot these photos of Dexter and Penelope, sleeping together on the couch. 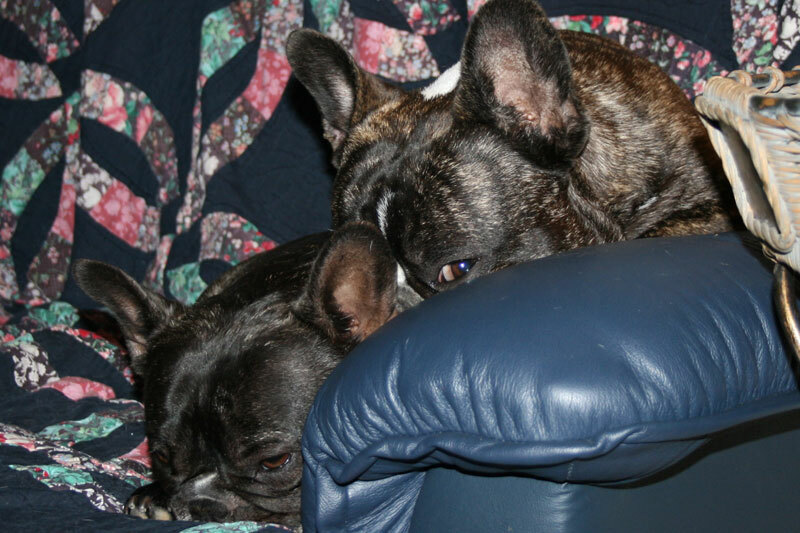 They were playing a game of “Frenchie Bunk Beds” – first Dexter slept on Penelope. 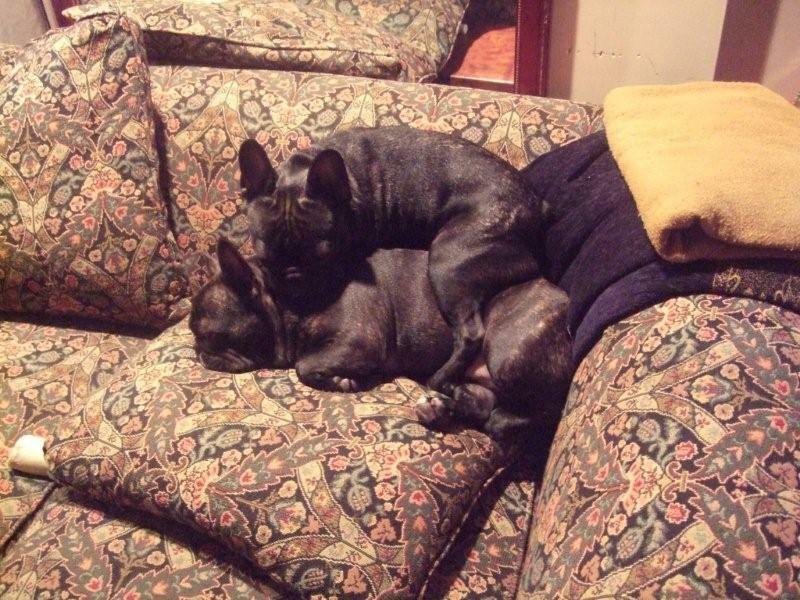 Then they swapped spots, and Penelope slept on Dexter (as fat as she’s getting, I think Dexter got the worst of the deal). 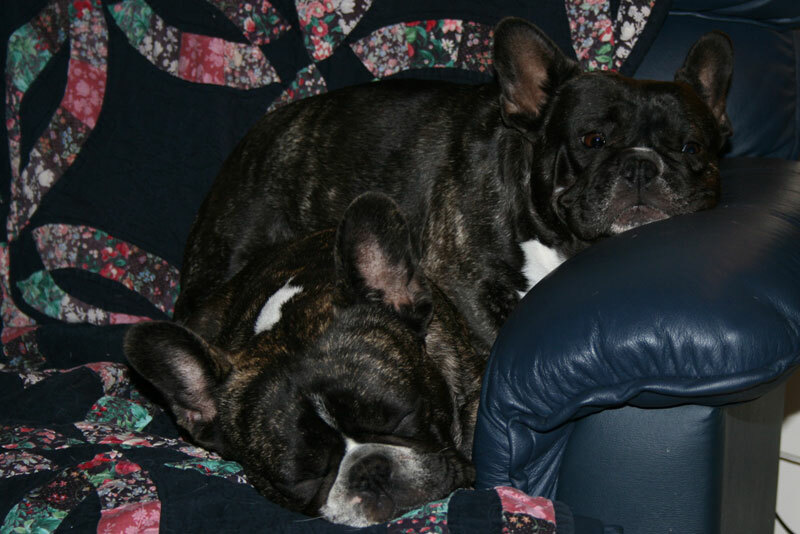 Jacques and Jewel are brother and sister Brindle Frenchies that were bred by Barb. They live in NYC, with their owner, Carol Rowbo. Here’s a gallery of their photos (as you can no doubt tell, they’re extremely photogenic). Jacques and Jewels’ mom Lola is now retired and also living in NYC, with Lauren Melkus. Lola rules the roost over her adopted little ‘brother’, Tucker. 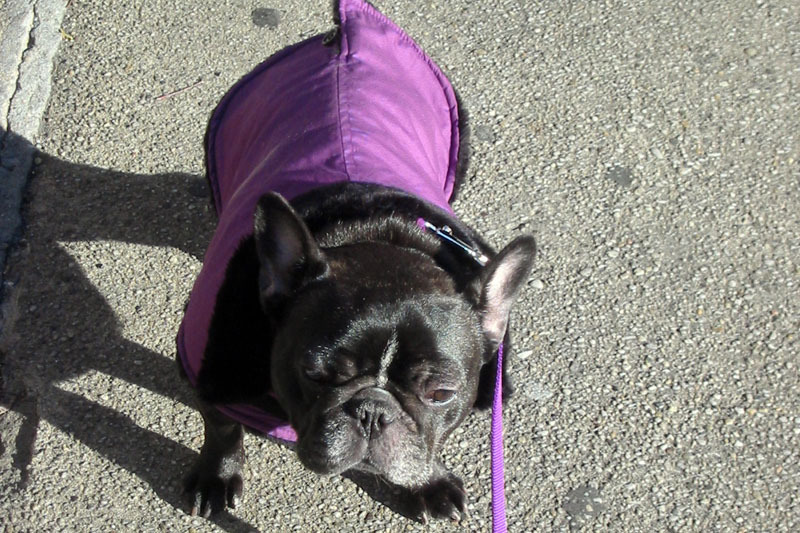 Here’s a photo of Lola, luxuriating in life in New York. 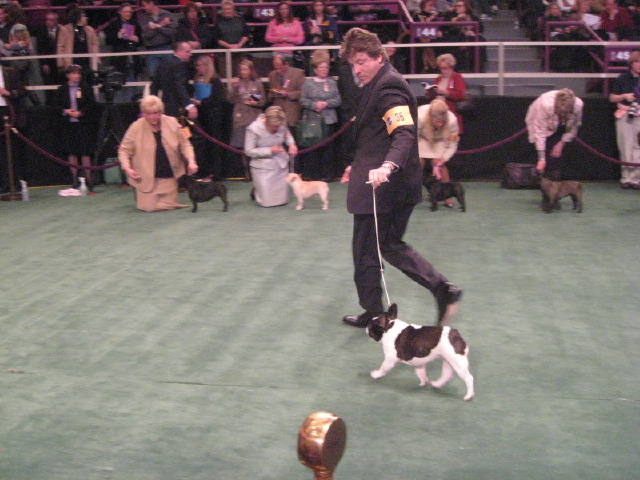 Oh, and Jacques and Jewels’ litter sister, Isabella, showed in New York at Westminster this past February. Maybe next year, her family (or at least her family’s family) can come out and cheer her on. Here she is, on the carpet at the Gardens. The last piece in this puzzle — Tucker was formerly know as ‘Harley‘, and he’s Dexter’s litter brother! OK, now we can all hum ‘It’s a Small World’. .. and lots of other stuff, including some musings on trying to turn an outside, semi feral cat into a house pet (hint: it’s not easy). Unless the sun comes up, in which case I’m outta here and off to the beach!